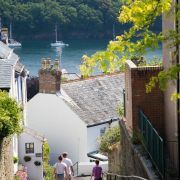 No sailing trip to Cornwall would be complete without a stopover in Falmouth, whose natural harbour, incorporating an extensive network of navigable rivers known as the Carrick Roads, is the third largest in the world. This vast expanse of sheltered water, accessible in all weathers and at all states of the tide, has for centuries bestowed a status upon this small town that far outstrips it's size. 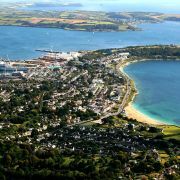 Already popular as the first and last port of call for grain-trade sailing ships travelling from the Atlantic or the Bay of Biscay, in 1688 Falmouth became a vital link in the chain of communication between London and the rest of the world when it was designated a mail packet station. When sail gave way to steam much of Falmouth's former industry shifted to the more usefully located Southampton, but thanks to burgeoning tourism the town continued to prosper. Ellen Macarthur is the latest in a long line of adventurers who have attracted the world's press to this remote Cornish town, whose character continues to be well and truly shaped by her maritime landscape. Falmouth's cobbled streets and narrow alleyways are dotted with figureheads from ships long-since wrecked, four marinas and several island pontoons serve visiting yachtsmen, and huge oil tankers from across the globe hang offshore like giant birds, waiting for the economic downturn to reverse itself so that their exiled crews can return home. 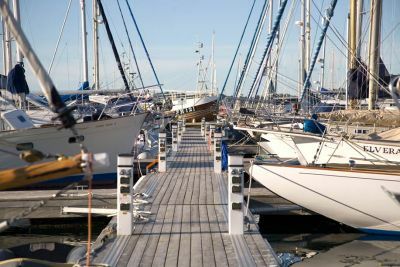 The nearest moorings to the centre of town are to be found at Custom House Quay, where Falmouth Yacht Haven operates year-round visitor-only pontoons. The pontoons have a minimum depth of two metres and offer a range of facilities from showers and toilets to WiFi and fuel. 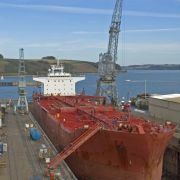 Within easy walking distance is the larger Port Pendennis, whose wider concrete pontoons can accommodate yachts more than seventy metres long and with a six metre depth on outer berths. As well welcoming superyachts, the marina at Port Pendennis, which sits adjacent to the National Maritime Museum, is well-served for regular boats, offering both sheltered winter mooring in the inner harbour (access three hours either side of high water, minimum depth three meters) and visitor berths in the outer section, with direct access to shops, restaurants and pubs. Aside from the harbour in Falmouth itself, there are numerous other places to stop along the many arms of the Carrick Roads. 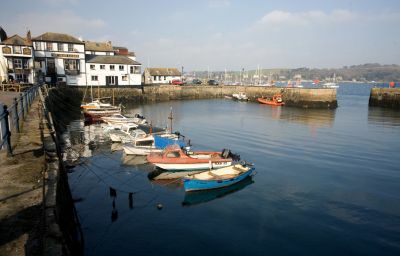 Directly opposite Falmouth is Flushing, a small town famous for the regatta held there every summer at the end of July. A week of events (including bathtub racing) culminates in the unmissable sight of dozens of gaff-rigged Falmouth Working Boats racing across the harbour. 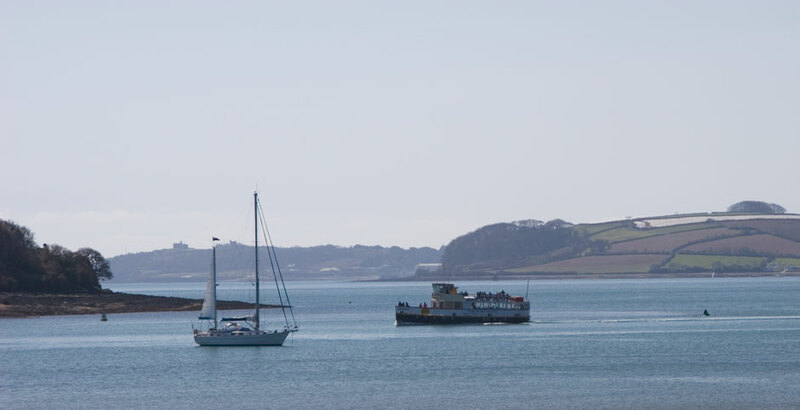 These traditional boats are still used in the Carrick Roads today where the traditional practice of oyster dredging is only permitted from sail-powered boats. The gaff-rigged Falmouth Working Boat is the result of generations of traditional workmanship. 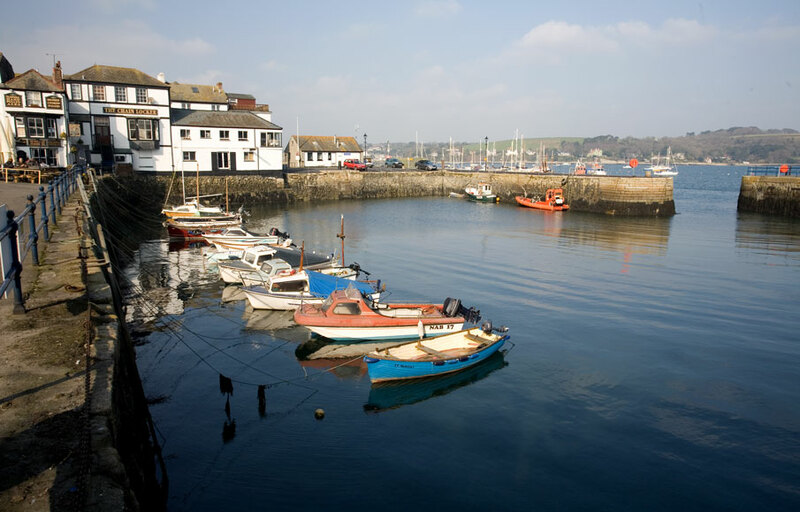 Continuing upriver from Flushing will bring you to the ancient town of Penryn, a boat building and repair hotspot. While Penryn's Town Quay is generally reserved for fishing boats, with the harbourmaster's permission it is possible to come alongside in order to take on fuel and water or make use of the lifting out facilities that serve the town's numerous boatyards. 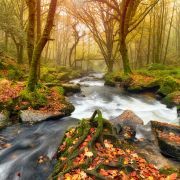 Across the channel to the east of Falmouth is the super-sheltered Percuil River, home to St Mawes, a picturesque town with a medieval castle. Visitor moorings are available by arrangement with Percuil River Moorings or St Mawes Sailing Club (excellent showers) which also operates ten green visitors buoys and further sheltered anchorages to the south of the town, although these can be uncomfortable in a strong southerly swell. Entry to St Mawes harbour is free of obstacles apart from the permanently-covered Lugo Rock, marked with a buoy. 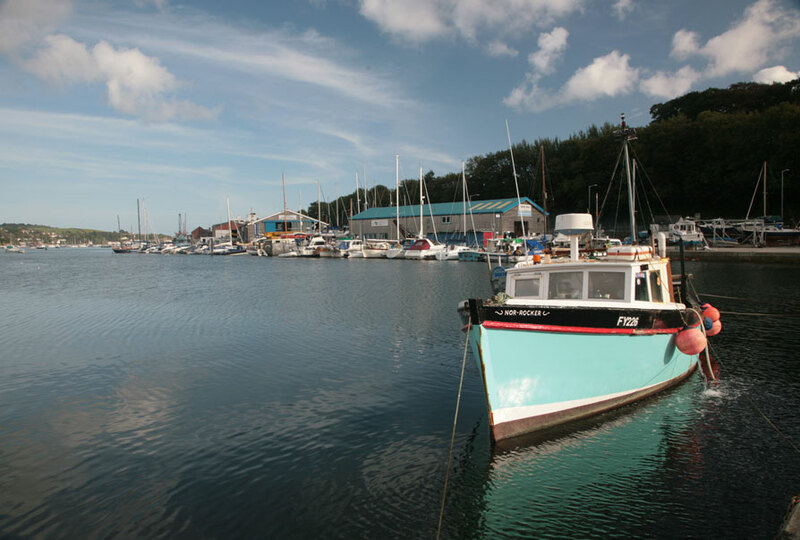 Heading north from Falmouth will bring you to Mylor Yacht Harbour, for many years the smallest Royal Navy dockyard in the country. Mylor is an attractive sailing village with an impressive range of facilities including a recently extended marina with all the usual provisions including a restaurant, bar and WiFi, a boatyard with a thirty-five ton travelift, a well-stocked chandlery, a fuelling berth and a visitors pontoon. 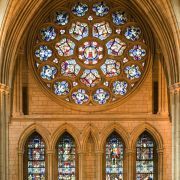 The river is navigable all the way to Truro, the county capital, where visiting yachts are permitted to lay alongside the central Town Quay or anchor alongside the navigable channel. Alternatively, deep and shallow water moorings are availabe a couple of miles downstream at Malpas, which is within easy walking distance of the city centre. If you have time to spare, a diversion into the secretive Restronguet Creek is highly recommended.Aside from a smattering of mooring buoys, Restronguet Creek is home to the popular and atmospheric Pandora Inn, which is flanked with it's own pontoon (dry at low water). 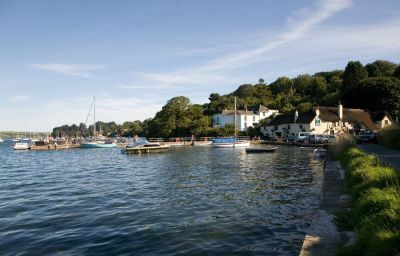 Running parallel to the Carrick Roads on the western side is the Helford River, which seperates Falmouth and the exposed Lizard Peninsula. The Helford Passage is a magical place of hidden inlets and crooked cottages to which entry is fairly straightforward, the only danger being a reef to the north marked with a green conical buoy. 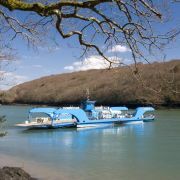 Private landing pontoons at the Old Helford Boatyard can be used in exchange for a voluntary contribution, while visitor moorings are available at the Ferry Boat Inn, Durgan Star Hire Boats and Gillan Creek. Upstream, the channel to Gweek, home to the Port Navas Yacht Club, is well marked. Falmouth inner harbour, Penryn River, the southern part of the Carrick Roads and a large part of Falmouth Bay are operated by the Harbour Commissioner's Office, a statutory port authority based a two minute walk from Falmouth Yacht Haven. An 8 knot speed limit is in force within the Penryn River and Falmouth Inner Harbour, which is reduced to 5 knots in the Percuil River, St Mawes, St Just, Mylor and Restronguet.